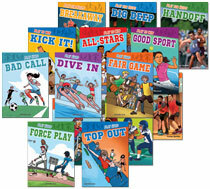 This multi-level fiction series offers reading experiences involving many popular sports across three reading levels! This multi-Level fiction series features teenage vampires and witches hiding in a normal community. Age appropriate stories and themes will engage struggling readers. This multi-level nonfiction series offers reading experiences in the Sciences, History, Social Studies, Technology, and Careers, across three reading levels! Bring all three strands of science to life with these high interest readers and 5E lessons that improve content-area learning. Inspire exploration of key science concepts through informational text that aligns with the Common Core State Standards. Designed to help all students grasp important historical people, events, and introduces classic literature. Written at four different reading levels. Provide a transition to upper level reading and motivate discovery with inspiring science and social studies topics.